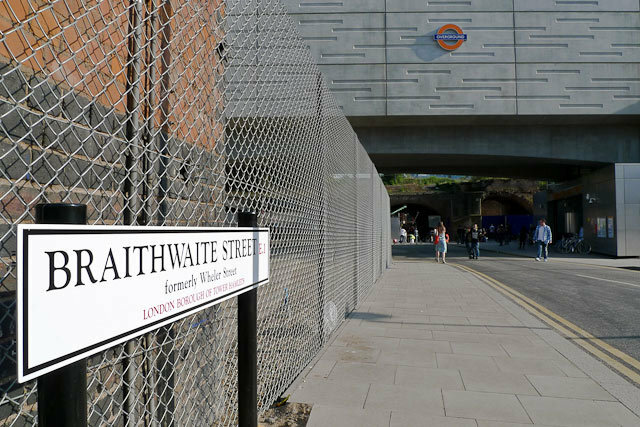 The northern part of Wheler Street, which runs under the new Shoreditch High Street station between Bethnal Green Road and Commercial Street, has been renamed Braithwaite Street in honour of one of the most influential men in British railway history. John Braithwaite, born in 1797, spent his 30s palling about with George and Robert Stephenson. After building, with John Ericsson, a steam locomotive called the Novelty, which was the first engine ever to run a mile in under a minute, he entered the Rainhill Trials; Novelty finished second to the only loco able to complete the trial — the Rocket. Braithwaite later turned to civil engineering, and, under contract for the Eastern County Railways, built an impressive pointed-arch viaduct for the first ever Shoreditch station, which served as that company's London terminus. 260m of what was once the 2km Braithwaite Viaduct, as it is known, are still standing, and it is one of the world's oldest remaining railway structures; it was originally scheduled to be destroyed as part of the East London line extension, but then-culture secretary Tessa Jowell listed the viaduct Grade II in 2002. Along with the ornamental gates on Shoreditch High Street, it is the only thing left of what was one of London's first major rail termini, and next to the concrete battleship of the new station, offers an illustrative reminder of Britain's railway heritage.